I am cheating a bit here and posting two photos, the old one on film and the recreation shot on digital 10 years later. 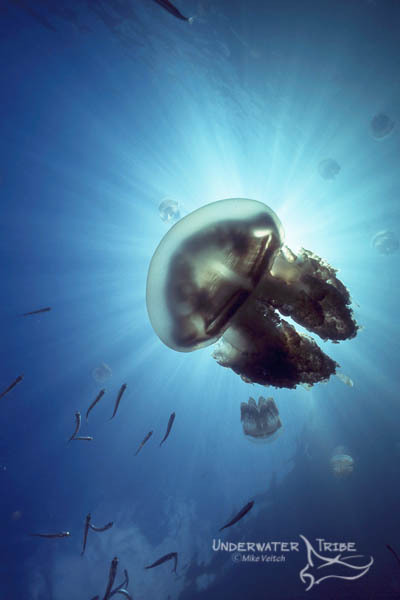 One of my more iconic images was shot on film back around the year 2000 in Palau and consists of a lone mastigias jellyfish silhouetted in front of a stunning sunburst. This was done simply by aiming my Nikonos V and 15mm lens at the jellyfish and trying a variety of fstops while shooting at 1/500 (I think). I then chose that image as the best from the series. 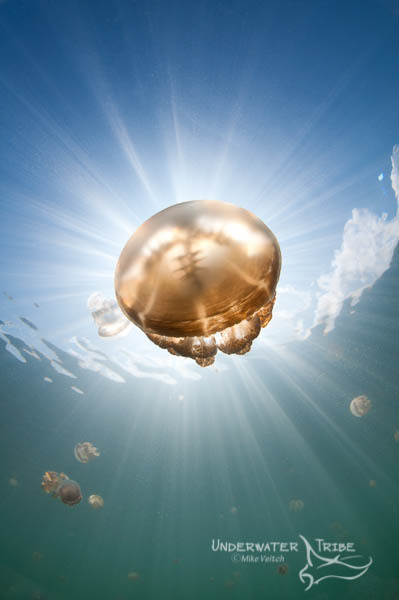 However, I was never 100% happy with the photograph as I felt the sun did “leak” a little too much from the side of the jellyfish simply due to trouble composing an image via parallax. Therefore, when I had the chance to visit the jellyfish lake at Kakaban Island in Kalimantan province, Indonesia it was one of my goals to replicate this shot. The difference this time being I was shooting with a digital SLR that allowed me to frame the jellyfish properly through the lens. Although the Jellyfish Lake at Kakaban is not home to as big of a population as the one in Palau, the jellyfish are plentiful and the lake is highly photogenic. Once again I set the camera at 1/500 and found myself a likely jellyfish model that was near the surface and spent some time shooting it. The process was easy, I simply exhaled to allow myself to sink under the surface and then framed the jellyfish to my satisfaction and then shot it with a selection of different fstops to achieve the result that you see here. I am very happy with the results of this recent shot and I believe it to be superior to the film version.